Former Georgia cornerback Deandre Baker participates in a drill Wednesday morning during the Bulldogs' pro day in Athens. 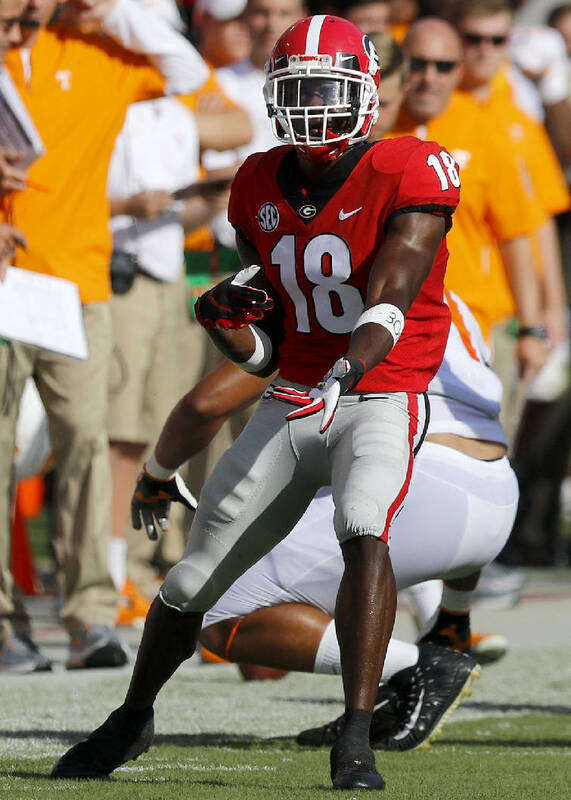 Former Georgia cornerback Deandre Baker could be a first-round pick at the NFL draft next month in Nashville. Three months ago, Deandre Baker became the first Georgia Bulldog ever to win the Jim Thorpe Award, given annually since 1986 to college football's best defensive back. Next month, Baker could be the first Georgia cornerback taken in the opening round of an NFL draft since Champ Bailey in 1999. In August, Bailey will be inducted into the Pro Football Hall of Fame. Baker has a long way to go to match Bailey's accomplishments, but he isn't lacking for the confidence necessary to make his mark at the highest level. "I know I am the best cornerback in this draft," Baker told reporters Wednesday as Georgia held its pro day for a group of NFL representatives that included New England Patriots coach Bill Belichick. "My film speaks for itself, and so do my stats and production." Baker was the headlining act among the 21 former Bulldogs who participated in varying degrees at pro day, a list that included Tramel Terry, who was a member of the volatile 2013 signing class. Terry was a reserve defensive back during the 2014 and '15 seasons before transferring to Football Championship Subdivision and Ohio Valley Conference program Jacksonville State, where he received a sixth season of eligibility due to injury and was a running back. A mock draft released this week on NFL.com has Baker going 29th overall to the Kansas City Chiefs. The 5-foot-11, 190-pounder from Miami held Florida's Van Jefferson and Missouri's Emanuel Hall without catches when matched up last year, and he limited Biletnikoff Award-winning receiver Jerry Jeudy of Alabama to three catches for 24 yards in the Southeastern Conference title game. That was the collegiate finale for Baker, who sat out the Bulldogs' loss to Texas in the Sugar Bowl. "It was tough watching it," he said. "My heart wanted to get out there, but I had to make a business decision." Georgia had three first-round selections last year with linebacker Roquan Smith (No. 8 to Chicago), offensive lineman Isaiah Wynn (23rd to New England) and running back Sony Michel (31st to New England). Nick Chubb was the third pick of the second round, getting tabbed by Cleveland, and the Bulldogs finished with six overall selections after having just one total pick in 2017 — receiver Isaiah McKenzie (fifth round to Denver). Possible second- or third-round selections for the Bulldogs next month in Nashville include linebacker D'Andre Walker and receivers Riley Ridley and Mecole Hardman. 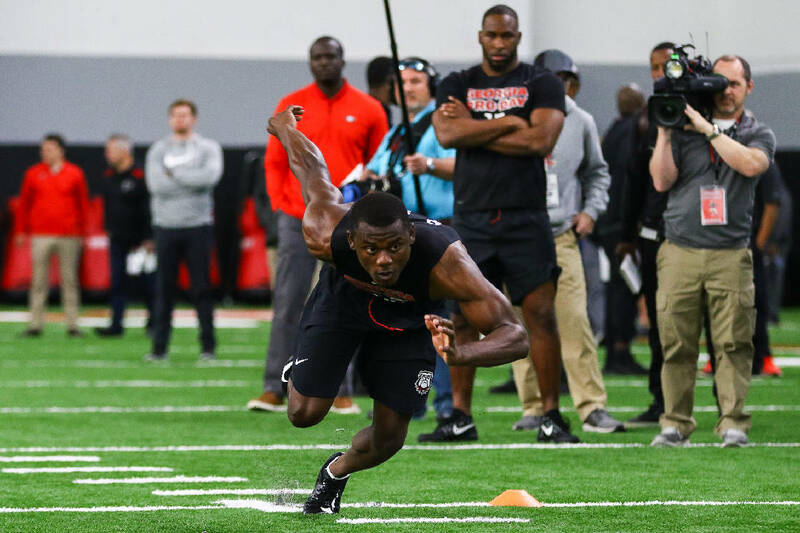 Among those likely destined for the draft's final day, which has rounds four through seven, are running back Elijah Holyfield, receiver Terry Godwin, tight end Isaac Nauta and center Lamont Gaillard. Holyfield had a troubling 40-yard dash time of 4.78 seconds at last month's NFL combine and was even worse Wednesday, turning in a reported 4.86. Hardman, Holyfield, Nauta and Ridley each chose to skip his final season of eligibility, and only time will tell whether they made the right choices. "We are really pulling hard for those guys, because the best thing that can happen for us is for those guys to get drafted as high as possible," Bulldogs coach Kirby Smart said. "We're looking forward to having a heck of a draft. We have the potential of having a lot of guys drafted."